People are passionate about sports, including you, and with the growth of organized sports reaching unprecedented levels, it’s time for you to get in the game with one of today’s top-rated sports franchises. Combine your passion for sports and your aspiration to be an entrepreneur and browse our list of top-rated sports franchises. Whether you end up with a franchise offering products or services, when it comes to sports, one thing is certain… if you build it, they will come. So get going! Rockin’ Jump is a family-friendly, indoor trampoline park with over with arenas for open jumping, dodgeball, basketball, a foam pit, large open jump arenas, private party rooms and a delicious café. As one of America’s fastest growing recreations with more than 20 locations globally, Rockin’ Jump offers franchise opportunities unlike any other. As a franchisee, you’ll receive top quality training and administrative support. The Apex Fun Run franchise makes a significant impact on local communities by raising funds desperately needed by teachers and schools. Their events typically raise twice the capital of traditional fundraisers. Along with fundraising activities, Apex Fun Run teaches young children leadership and development skills found nowhere else. If you have been searching for one of the top sports franchises that capitalize on your high level of energy and desire to make a contribution to local students, teachers and schools then Apex Fun Run may be the one for you. Golf Tournament Outfitters is an 11-year-old company offering a turn-key marketing business which supplies gift items and facilitates on-course contests for charity golf tournaments. This is a work-from-home seasonal business, so they also sell member perks to membership groups and fundraising incentive items to non-profit organizations. This can be a great part-time income opportunity for someone who might be retired, or you can work this business full-time throughout the year. It is your choice, since there are no sales quotas and it is your business to run. Expect annual full-time income up to $50,000. They provide a connect-the-dots marketing and sales plan along with the sales tools and forms you will need to solicit charity golf event directors. They also provide training to get you started and follow-up support as long as you need it and will supply you with office support and drop-ship all products directly to your customers. British Swim School was created to provide new franchise owners with a feeling of fulfillment and purpose in helping save children’s lives. Unlike the other swim schools, British Swim School owners don’t need a great deal of money to get their businesses up and running. British Swim School has spent years developing partnerships with existing organizations to find existing pools for its franchise owners to utilize. The organization reaches more than 6,000 students per week and conducted more than 250,000 swimming lessons in 2013. Soccer 5 is a leading small-sided soccer operator in the USA, and it is widely forecast Soccer will be the most popular sport here within the next five years. Soccer 5 is all about social soccer, and small-sided games are the easiest way to play for adults and kids. Games are outdoors or indoors and played on fields capable of hosting games from 5 v 5 to 7 v 7. In 2005, founder Bill Parisi started franchising the Parisi Speed School and his proven methodology. Since that time the network has grown to over 85 locations in 31 states across the US as well as several locations internationally. His proven business models allow owners to tap into the ever-growing youth market to: own your market through our protected territory program, begin a youth program with instant credibility that includes an established concept, a reputable brand name, and a nationally recognized professional athlete client list and utilize proprietary and proven training methodologies that generate safe and effective results. Kids in Sports was started in 1999 in New York City by Michael Strutt and Kenneth Colon whose passion for sports and coaching led them to design programs that teach children ages 12 months to 12 years the fundamentals of sports in a safe, fun, friendly and supportive environment. In addition to the basic rules and skills of sports children learn sportsmanship, teamwork, respect and communication — the building blocks for young athletes. The founders’ goal is to team up with qualified people that will bring the same passion and energy for operating a children’s sports program as they always have. They, along with their team, manage all support of their franchisees. Kids In Sports is positioned to be a leader in the area of Children’s Sports instructional programs and they look forward to expanding their successful brand. Based in Tampa, Florida, i9 Sports is one of the nation’s first and largest youth sports franchises business in the United States with over one million registrations in more than 500 communities from New York to Hawaii. i9 Sports offers youth sports leagues, camps and clinics for boys and girls ages 3-17 in today’s most popular sports such as flag football, soccer, basketball, t-ball and cheerleading. With their focus on fun, safety, convenience and good sportsmanship, i9 Sports is reinventing the youth sports experience for families across the country. Play It Again Sports offers value-conscious buyers a wide selection of name-brand new and quality used sports and fitness equipment in sizes to fit everyone from little leaguers to major leaguers. Their merchandise and environment are designed to encourage and reassure enthusiastic parents and youngsters by presenting a comfortable mainstream retail image. Their unique business model allows customers to create their own discount by trading in product they no longer use. They have a strong value proposition: great new and quality used sports and fitness gear at affordable prices. Based in Centennial, Colo., GolfTEC began franchising in 2003. GolfTEC centers offer indoor golf lessons, using video and motion measurement to analyze students’ swings and offer visual instruction. The company has also developed a golf club fitting process to help players find the clubs that best suit them from a database of over 1,000. College Prospects of America (CPOA) is passionate about helping students achieve their goals, be it through athletics, academics, or both. Since 1986, CPOA has helped thousands of families from the US and around the world find the right athletic, academic and financial opportunity at colleges and universities in the United States. CPOA helps navigate the highly competitive and complicated college process so that customers can find the right opportunities for them, based on academic, athletic, or financial needs. With RedLine Athletics, your own business in sports and fitness is within reach. RedLine Athletics specializes in training young athletes in the 8-18 year old age range. It occupies a unique niche in the $38 billion fitness industry. An estimated 35 million children participate in youth sports every year. There is a tremendous need and demand for specialized fitness and athletic training for the 8-18 year old market. Youth sports represents a large industry, conservatively estimated at $5 billion a year in the United States alone. Fleet Feet Sports offers you the opportunity to combine your dreams of working within the fitness industry and operating a specialty retail business. Fleet Feet Sports provides a proven business model with support from an experienced team of small business experts and retail leaders. 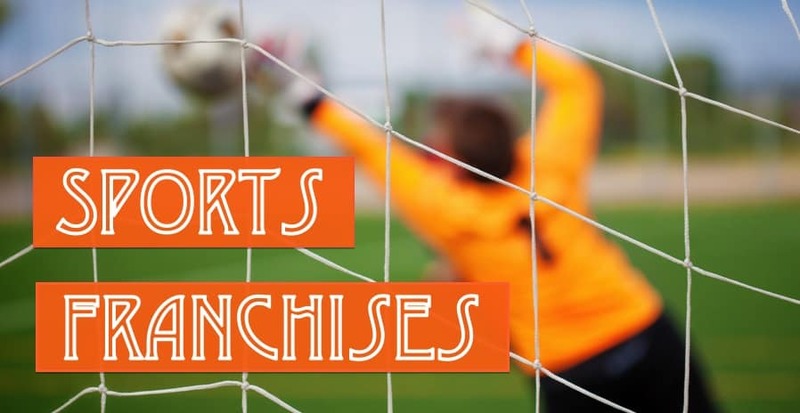 As a franchisee you will have access to Fleet Feet’s experienced staff, a large pool of fellow franchisees who have been through all of the stages of the process, and access to our proprietary “best practices” that have been established throughout the Fleet Feet Sports network. Pro Image Sports is the perfect opportunity to make your passion your business. Pro Image Sports has been one of the leading sports franchises for nearly 30 years. Their stores have a strong following of customers looking for authentic, fashionable, licensed sports apparel and novelty items. Local owners distinguish themselves from the competition by catering their product mix to match the demand of their markets. As a franchisee, Pro Image Sports provides each business with ongoing professional services and support that will ensure a successful launch and sustained operation. With SailTime your dream to combine your passions of boating, being on the water and flexing your strong business background is now within reach. SailTime is the world’s largest boat membership company with 35 locations worldwide. With SailTime, members can boat all season long on a new model yacht for a simple low monthly fee. SailTime is the most exciting franchise business opportunity in the boating industry in the past 10-20 years. As a SailTime franchisee you will enjoy a challenging and rewarding lifestyle. A Monster Mini Golf franchise provides an exciting and fulfilling work experience for those who are looking for unique sports franchises. As a Monster Mini Golf store owner, you’ll be part of the fastest-growing family entertainment chain in the nation. If you’re seriously considering becoming a Monster Mini Golf franchisee, we’ve included a lot of useful information on our website to help you gain a better understanding of the entire application process to determine if becoming an independent franchise operator is right for you. IntelliTurf Franchise is a golf franchise and artificial turf business with low overhead, small inventories and few full-time employees. The artificial turf products and the putting green business cast a wide net to attract customers from multi-housing, senior housing, private residences, schools, churches and commercial properties that utilize artificial turf surfaces for a variety of reasons. Installing amenities that are beautiful and fun for residents of all ages is the focus of the IntelliTurf Franchise system. Golf, landscaping, playgrounds, lawns and activity fields are all part of our product family.